The Buy House Essentials!! 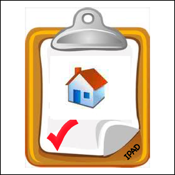 app is ideal for helping plan for buying your new house. The Buy House Essentials!! app provides a quick and visually appealing way to indicate whether steps for buying your new house have been done. The Buy House Essentials!! app can easily be personalised so that you can add specific items that are unique to your purchase of a new house. The Buy House Essentials!! app can also display any of your reminders in the iPhone Calendar.